Last month I told you about the Victoria Hotel and the disastrous fire which burnt this beautiful tourist establishment to the ground in 1944. With the Victoria gone, little was left of Port Maitland’s grand olde days as a tourist Mecca. A few places were left but the heart of tourism was weakened considerably. Milo Gillap’s was gone, as was Dolly Gray’s, on the east side of the river. Remaining on the west side of the Grand, we move up the river to the large triangular shaped lot at the fork in the road. This building was built for William Ward, who along with his wife Sarah Scaife raised their family of seven children and later ran it as a boarding house. William, did not completely trust his good fortunes to come from his American tourists. In 1882, he was hired out by the Township of Dunn to draw 125 yards of solid clay at 20¢ per yard to build the embankments across the marsh leading to Port Maitland (I believe this the section of Kings Row between the four corners and the Grand River.) and in front of the breakwater along the rivers edge. After the death of William and Sarah, their son William ran the boarding house for many years. John and Henrietta Siddall, for more than thirty years operated a boarding house on the east side of the river known as Willow Dale. The property on which the Willow Dale was situated was sold to the TH&B Railway in 1915. Under an agreement with the railway, John and Henrietta remained at Willow Dale for a few more years. In the early 1920's they relocated to the west side of the river and took ownership of the Ward cottage as it was then known. It was renamed Willow Dale Home and continued as a summer boarding house. John an affable old gentleman built a set of swings on the sandy shore of the river where he is remembered for a game he played with the local children. He would toss a fifty-cent piece in the air and let it fall into the sand leaving the children to scramble and fine it. The Willow Dale Home was a very large building sitting in a beautifully manicured park-like setting. In an undated postcard during the ownership of Henrietta Siddall, now a widow we see this building with the caption “Willow Dale Home Meals and Lodging.” Henrietta enjoyed her summer boarding house and her tourists until she passed away in 1936. 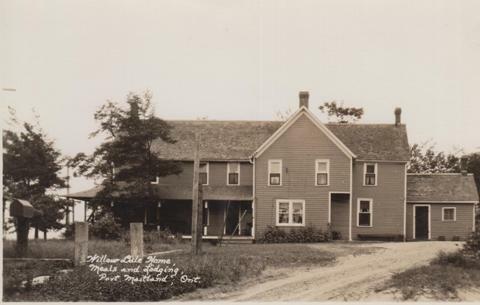 Some of the more senior citizens at Port Maitland refer to the Willow Dale Home as the “Old Siddall homestead on the hill.” In the short period between William Ward’s ownership and that of John and Henrietta Siddall, the old tourist home was used by the Hamilton YWCA as their summer camp. They later relocated to Connor’s Bay on the east side of the river where the Sandy Shores trailer park is today. My recollection of Willow Dale Home is vague at best. It had seen better days and as far as I have been able to tell was never used after Henrietta died in 1936. I recall it as a building in need of a good paint job. Locals tell me it was torn down sometime in the 1970's. Someone please come to my rescue and tell me more about it. Across from Willow Dale Home is the Martin, or Exchange, or Maitland Arms Hotel. 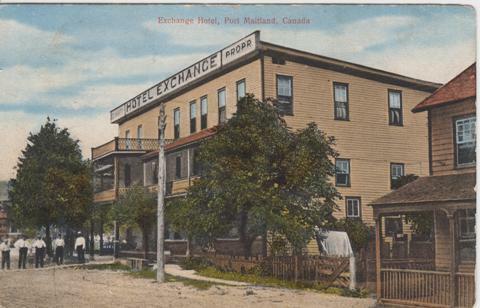 In the later part of the eightieth century the Exchange Hotel was the preeminent place to stay while visiting Port Maitland. Many accounts can be found of well-to-do Americans visiting Port Maitland in their sail and power crafts who then registered at the Exchange for the weekend or longer. A group of famous 19th century American artists belonging to the Bohemian Art Sketch Club of Buffalo used the Exchange as their summer residence while painting the local landscape. The Martin Hotel was built by William and Eleanor Martin in 1884. By Mid July of 1888 William Martin boosted to his friends that he had already had over three hundred American guests register at his hotel. Sometime possibly in the 1940's, the Exchange became known as the Maitland Arms. During the short lived ownership of Frank and Eleanor Stouph the Maitland Arms burnt to the ground in the spring of 1961. The Stouphs’ as a requirement of their insurance rebuilt and by 1963 the present block building was complete. The heart of the tourist trade at Port Maitland was in cardiac arrest and has yet to recover to it 19th century glory days.